This site is located at 2626 Kalakaua Avenue, Honolulu, Hawaii. The GPS coordinates for this location are N 21° 16.390 W 157° 49.422. 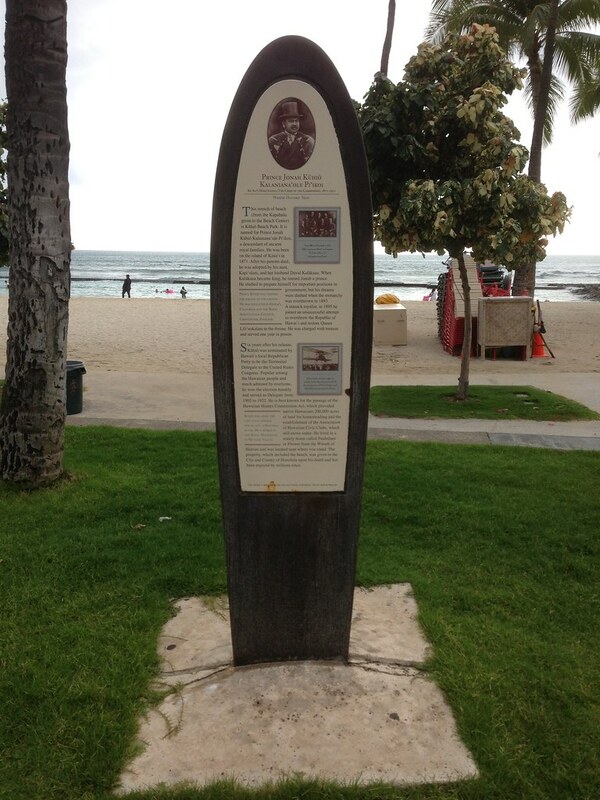 There are twenty other markers on the Waikiki Historic Trail. This stretch of beach (from Kapahulu groin to the Beach Center) is Kuhio Beach Park. It is named for Prince Jonah Kuhio Kalaniana’ole Pi'ikoi, a descendant of ancient royal families. He was born on the island of Kauai in 1871. After his parents died, he was adopted by his aunt, Kapi'olani, and her husband David Kalakaua. When Kalakaua became king, he named Jonah a prince. He studied to prepare himself for important positions in government, but his dreams were dashed when the monarchy was overthrown in 1893. A staunch royalist, in 1895 he joined an unsuccessful attempt to overthrow the Republic of Hawaii and restore Queen Lili'uokalani to the throne. He was charged with treason and served on year in prison. 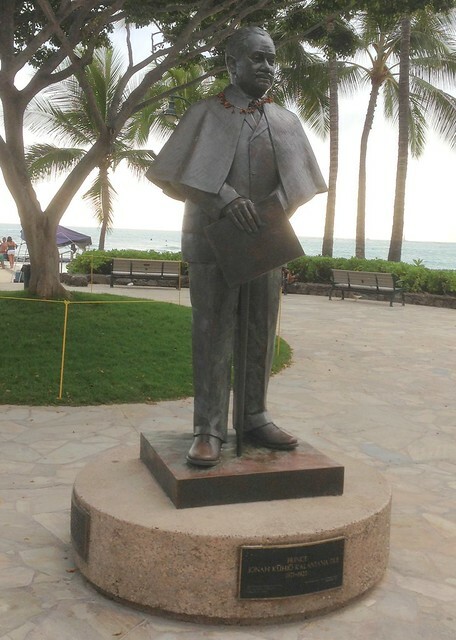 Six years after his release, Kuhio was nominated by Hawaii's local Republican Party to be the Territorial Delegate to the United States Congress. Popular among the Hawaiian people and much admired by everyone, he won the election handily and served as Delegate from 1902 to 1922. He is best known for the passage of the Hawaiian Homes Commission Act, which provided Hawaiians 200,000 acres of land for homesteading and the establishment of the Association of Hawaiian Civic Clubs, which still exists today. He lived in a stately home called Pualeilani or Flower from the Wreath of Heaven and was located near where you stand. The property, which included the beach, was given to the City and County of Honolulu upon his death and has been enjoyed by millions since.